The Act has been amended twice in its history. In 1980 the scope of the Act was narrowed as it was amended from covering all Aboriginal sites to only sites of ‘importance and ‘significance’ (Chaloner 2004). This introduced a philosophical change to the Act, as it now required subjective decisions to be made on what was important and significant. In 1995 amendments were passed that transferred the responsibility of the Acts administration from the independent WA museum to the Minister for Aboriginal Affairs and the Department, which put Aboriginal heritage decisions under political control (Chaloner 2004:207). Heritage sites may be valued for there cultural values, which includes associations with stories and tradition, for there archaeological and scientific values, and for there aesthetic values. When ‘importance’ and ‘significance’ is assessed under the legislation by the Department, whose values are the interpretations reflecting? Is an aboriginal site under WA law defined by Aboriginal people, archaeologists, the general community, lawyers, government beaurocrats or a combination? The question of how sites are defined and what sites are protected is increasingly relevant today, as there is greater competition for land use and upwards pressure on heritage sites. History testifies to numerous examples in WA where Aboriginal heritage sites were threatened or impacted by industry, despite the fact these were places that the Act was designed to protect. This leads to the question- why weren’t these heritage places protected? And further, what type of Aboriginal places are being protected under the legislation, and who gets to decide what is worthy of protection and what isn’t? all Aboriginal heritage places in WA are legally eligible to be impacted or destroyed if a developer requests a s18 permit- available information from 2002 shows the ACMC rejected only 3% of Section 18 permits. Prosecutions are rare, data from 2002 show only 3 successful prosecutions in 30 years.. Examples of breaches to the Act as recent as 2011 at James Price Point and Solomon Hub were never pursued or prosecuted by the Department, despite the express wishes of the Aboriginal custodians. a 2011 report by the WA Auditor general found the Department to be an ineffective regulator; the report found the department did not effectively monitor compliance with the legislation, and when it found instances of non-compliance, it failed to act (Murphy 2011). What can the WA community expect if the current amendments to the Act are implemented– will the new amendments indeed lead to decreased heritage protection, as was predicted by many respondents in submissions made this year? To address this question, I have ‘excavated’ the Aboriginal Heritage Act, peeling back the layers of changes over time to determine trends and patterns. Identifying trends will allows us to predict what these current amendments are likely to mean for the future of Aboriginal heritage in WA. 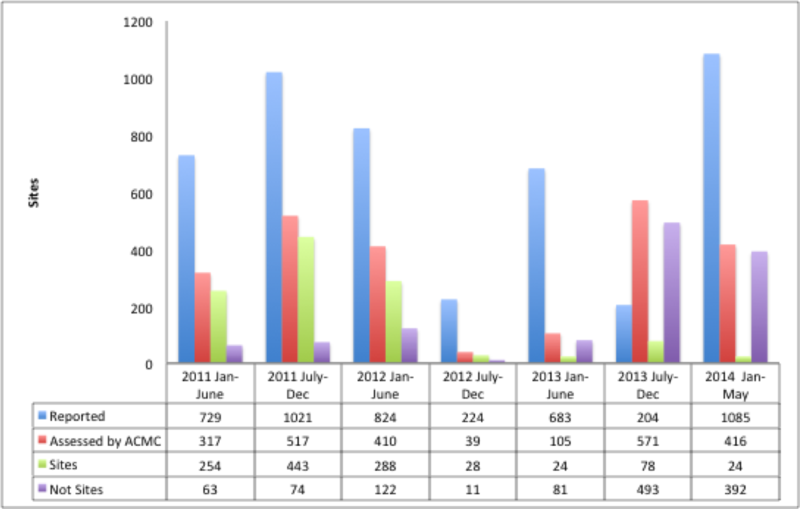 Data from 2011 until this year show there has been changes in the way the Department are determining sites. The total number of Aboriginal heritage places reported to the Department are shown in blue, the number of places determined by the ACMC as being a site are in green, and the number determined not to be sites are in purple. 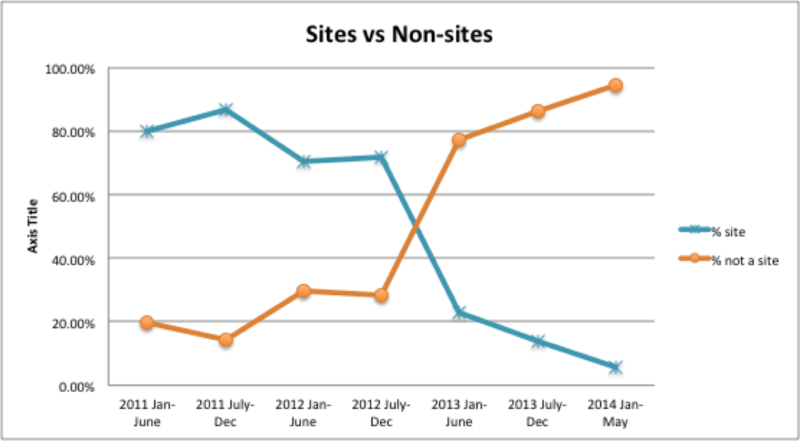 In 2012 there is a dramatic drop in the number of places the ACMC is are accepting as sites, and from 2013 onwards the ACMC for the first time is rejecting many more sites than it is accepting, which is a dramatic change from the preceding years (Figure 1). Another way of visualising this is that in the years presented here, the number of places being accepted as sites by the ACMC has dropped from 80% to 6%–A 74% decrease in 3 and a half years, showing the dominant attitudes and practices within the government are changing (Figure 2). From March 2011- March 2012 27 registered or otherwise known sites we de-registered by the DAA. These are places that were formally considered by the department to be sites under the Act. This evidence indicates the Department is changing its interpretations of the legislation, revealing that interpretation is more powerful than statute. I have found no evidence that this change in interpretation is a reflection of Aboriginal, anthropological or archaeological views on heritage sites. What then is driving these dramatic changes? These changes can be traced back to October 2008, when the newly elected Barnett Government issued a document titled Improving the Approvals Process, from the DPC, where they elected to take a comprehensive review of the Act. From this, an Industry Working Group (IWG) was formed in 2009 with the purpose of identifying problems with the approvals process, and seeking solutions to remedy these problems. The IWG recommended immediately implementing administrative changes to the heritage approvals system. These documents indicate the changes we are seeing in the administration of the Act and the effects this is having on the interpretation of what are important and significant heritage places, were driven by a government desire to streamline the approvals process. This is supported by claims from heritage practitioners and Aboriginal groups that Government consultation with them on the Amendments was very limited, while industry got a much better hearing (See alsoYamatji Marlpa Aboriginal Corporation). In fact, as these Industry Working Group documents indicate, industry in had early input in the initiation of these legislative and administrative changes. Certain recent cases show that the Aboriginal heritage process is too closely tied to political and industry influence. James Price Point 60kms’s north of Broome was the chosen site for a gas hub by Woodside Energy and the State Government. The TO’s of the JPP area, the Goolarabooloo, rejected the gas hub as they claimed it would damage the Lurujarri Song Cycle and important sites that form it. The anthropological and archaeological significance of the Lurujarri song cycle and the areas contained within have been well-documented since 1989. Some sites that formed part of this landscape are important due to their association with the body of knowledge and law known as the Northern Tradition, the information of these sites is restricted only to initiated men. For this reason the locations of some culturally sensitive sites are not publicly available, however information on culturally sensitive sites and mens law were recorded in 1991 in a confidential WA Museum report, held by the DAA and the KLC (Chalk & Fitzgerald Lawyers 2011:7). In 1991 an all-male subcommittee of the ACMC made a positive assessment of the significance of the Song cycle upon reviewing the confidential report, and determined that “no exploration activities should occur within the areas defined as the Song Cycle path“. The existence and geographic extent of the song cycle is a matter of objective record, the significance of which appeared to be overlooked when James Price Point was initially considered as a possible site for the proposed gas-hub (Chalk & Fitzgerald 2011:2). The department of State Development had been sent a brief in January 2009 from DAA outlining the heritage values of the James Price Point area -however this advice was apparently misplaced. Due to the impracticality of size, the songcycle in its entirety was not registered as a ‘site’ with the DAA, but some discrete sites within it were. The AHA in principle protects all aboriginal sites wether known or unknown, which puts the onus on a developer to make reasonable precautions that they do not disturb Aboriginal sites. This means unreported sites or sites which are yet to be assessed by the ACMC have the protection of the Act. On the 6th of July DAA’s compliance officer advised Woodside that their clearance work was likely to disturb a previously unreported site, and on the 8th of July Woodside were directed to immediately stop works as the site was in danger of being impacted. Woodside ignored this advice, and were further advised that if they continued they may risk committing an offence. 25th of July Woodside were issued a notice to cease activities within a hatched area on an accompanying map, until the status of the site could be determined. 3rd of August, Woodside wrote to deputy director general of DAA Duncan Ord and requested the advice and map issued to Woodside on the 25th of July be withdrawn , which incredibly, 5 days later he did. Instead, Mr Ord offered Woodside a more refined map with a dithered boundary, however Woodside rejected this information also, claiming “that Woodside had no basis to consider that new credible information existed in relation to a possible site anywhere, let alone in the dithered boundary area provided”(p.1). Woodside subsequently requested that the second map be withdrawn, and requested that any new site information was given to Woodside to review before it was given to the ACMC for consideration (p.1 of attached). Woodside were effectively able to ignore the direction of the regulator, they were able to argue for their purposes that a site did not exist in the area in question. Woodside denied they were provided with any new, credible site information, and that the cultural restrictions denied them procedural fairness. They argued the because of the size of the heritage place in question, it would be unlikely to meet definitions of a site under the Act, and further questioned the legitimacy of the Goolarabooloo Law Boss’s as informants, suggesting they had acted vexatiously in indentifying the site. 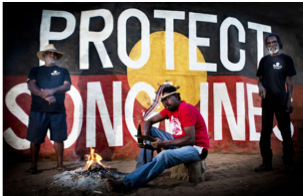 This ‘divide and conquer’ method by industry where the legitimacy of un-cooperative aboriginal informants is maligned has also been employed by industry in the cases of the Lake Yindarlgooda and Yindjibarndi disputes also (FOI Lake Yindarlgooda 2013). Instead of the Aboriginal, anthropological or archaeological definitions of this site being accepted for the purposes of the law, Woodside were able to assume this role and accept their own definition of what a ‘site’ is. Further, despite being the regulator, the DAA were at the very best completely impotent in providing any protection to the heritage place, in fact the deputy director general contradicted the advice of its own officers in acquiescing to Woodside’s requests. Goolarabooloo’s lawyers wrote to the Minister for Aboriginal Affairs, alleging Woodside had committed an offence and providing evidence of the offence. They strongly encouraged the DAA prosecuted Woodside, or else transfer their powers of prosecution to Goolarabooloo Law Boss so that he could prosecute (p.4). Neither were done, and because there is a 1 year window in which to prosecute offenses under the Act, it is no longer possible.This demonstrates that despite the great traditional and sacred significance of this site, it did not have practical protection from the law. 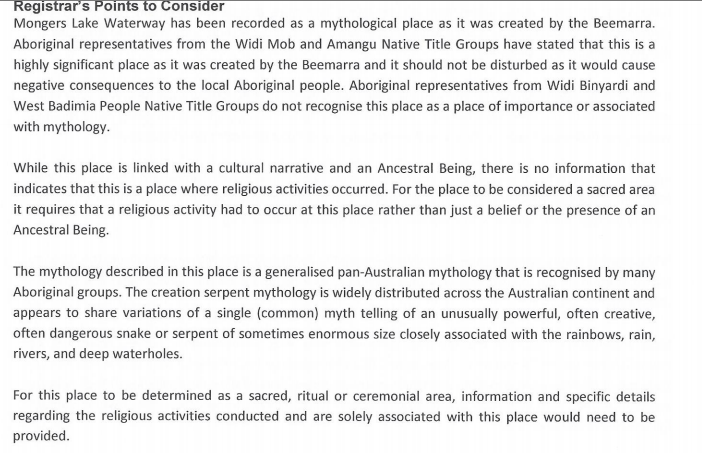 The Department has changed its definition of ‘sacred site’ under the Act, currently arguing that to be ‘sacred’ the site must be dedicated to religious use, not mythological story or song. This is certainly flawed anthropologically, and may also be flawed legally. This interpretation is currently subject to a Supreme court challenge by Aboriginal custodians in Port Hedland. This interpretation of a site, was used to deregister Lake Yindarlgooda in the Goldfields, after intense lobbying from companies with mining interests in the area. The department argued the site was ‘mythological’ and that the whole site must be dedicated to ‘religious use’ in order to have protection of the act (FOI Lake Yindarlgooda 2013). This method is being used to justify plans to deregister Lake Mongers Waterway, a very significant mythological site associated with Beemurra the rainbow serpent in Midwest WA. The Department recently issued advice to the Widi mob of the area that Lake Mongers Waterway was longer considered as meeting the criteria of being a site under the act, as there was no evidence of religious activities. 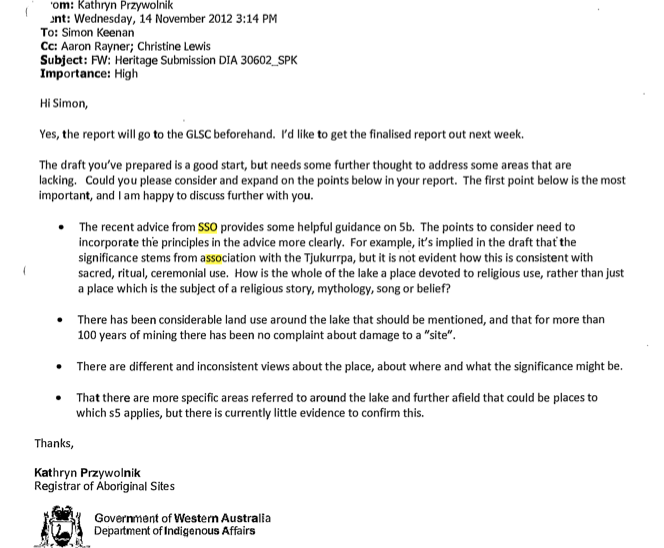 YMAC has pointed out that this interpretation was a a gross misunderstanding of Aboriginal spiritual and cultural practices, and that some places are so sacred that they are not used, i.e. if they are associated with a malicious or dangerous spirit (YMAC 2014). Information I have received from a former ACMC member stated that this new interpretation used by the Department and the ACMC has come from legal advice from the State Solicitors Office that was tabled at an ACMC meeting around late 2012 (Mike Robinson pers.comms. 2014). This is yet to be confirmed by the Department or Minister, yet reference to the SSO documents were made in the Lake Yindarlgooda FOI documents (figure 3). The evidence infers that the interpretation of what a ‘site’ is for the purposes of the law is changing, and that the new interpretations are at odds with Aboriginal and anthropological definitions. There is evidence to suggest that these changes have been made to streamline the approvals process for developers, by rejecting Aboriginal definitions of sites. I would argue the evidence presented would indicate the current amendments to the Act will mean weaker protection for sites that are important to Aboriginal people as there will be greater political control on the definition of sites, and evidence shows ‘mythological’ places are no longer accepted. It is a sobering realization that the sacred Weebo site that was the impetus for the initial drafting of the Act in 1972 would currently not receive protection under the Acts current administration. As the new amendment bill is currently before WA parliament awaiting debate, now is the critical time to be heard and influence government. Meaningful and fair changes must be made to the current system that will account for Aboriginal definitions of heritage sites, recognizing their rights and responsibilities to heritage. Archaeologists as heritage experts must help lead this debate, so WA is not locked into another 42 years of heritage protection failure. Chalk & Fitzgerald Lawyers 2011 letter to Environmental Protection Agency 2011-12-22, Freedom of Information released by the Department of Aboriginal Affairs;p7. Chaloner, T. 2004 The Aboriginal Heritage Act 1972: A clash of two cultures; a conflict between two laws, Parliamentary Internship, Murdoch University, Perth. Freedom of Information Application FOI-014-2013 Lake Yindarlgooda 2013. Requested by Robin Chapple MLC, Greens Member for the Mining and Pastoral Region, Western Australia. Released by the Department of Aboriginal Affairs: Western Australia. Murphy, C. 2011 Ensuring Compliance with Conditions on Mining. Perth: Western Australian Government. 8. Robinson, M. 2006 Retaining the Traditional Past: Anthropology and the Shaping of the Aboriginal Heritage Act. University of Western Australia, Perth.